Shia-Sunni Conflict Forces U.S. Shift in Iraq America's aims in Iraq changed as the sectarian conflict between Shia and Sunni deepened. Now bringing stability to Iraq is the goal, while preventing Shiite Iran's emergence as a regional power. The final report in a five-part series. 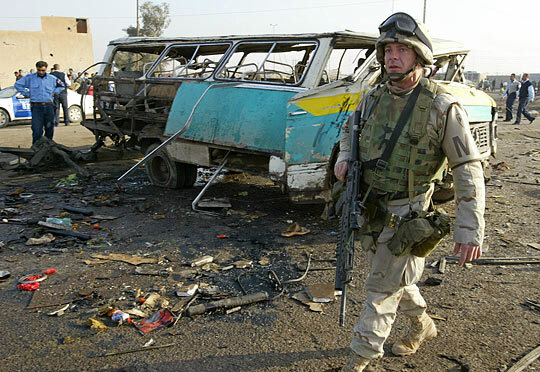 A U.S. soldier walks in the area where a tanker loaded with explosives blew up, killing at least 16 people and wounding a dozen in Baghdad, in December 2003. 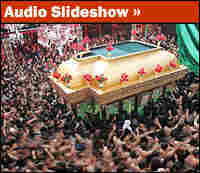 When the United States invaded Iraq in 2003, President Bush declared that the aim was to overthrow Saddam Hussein and bring democracy to Iraq. The president also made clear that he had wider ambitions in the Middle East — to spread democracy and fight the war on terrorism. Over the years as U.S. policy ran into reality in Iraq — as the sectarian conflict between Shia and Sunni deepened — U.S. aims have changed. Now bringing stability to Iraq is the goal, while preventing Shiite Iran's emergence as a regional power. For years, the Bush administration tried to deny one of the obvious outcomes of the U.S. wars in Afghanistan and Iraq — that with the overthrow of the Taliban and Saddam Hussein, Iran has emerged strengthened and confident. Now administration officials seem obsessed by Iran. "The threat that Iran represents is growing," Vice President Cheney said recently on Fox News. "It's multidimensional, and it's, in fact, of concern to everybody in the region." Those concerned — Cheney mentioned Saudi Arabia, Egypt, Jordan and the Gulf states — are all American friends, according to the vice president. They are also all governments led by Sunni presidents or kings. Yet at the same time, the United States is backing a Shiite government in Iraq that has close and cordial relations with Iran. It's a policy of contradictions, says Augustus Norton, a historian of the Middle East at Boston University. "The U.S. is building an alliance in the Arab world against Shii Iran," Norton says. 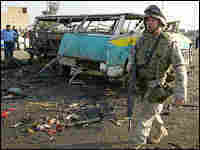 "At the same time, the U.S. is trying to maintain friendly relations with a majority-Shii government in Baghdad. I don't think this is a very stable solution." Far less diplomatic is Ayman Shaheen, a Palestinian professor of political science in Gaza. "You worked against history," says Shaheen. "[There's] never [been] a Shiite government in the Arab world, through 14 centuries. Shiites will never govern in the Arab world. And this is your fatal mistake. That's why you will pay a big price." At the same time, the U.S. view of some Shiite forces in the Middle East — specifically in Lebanon and in Iraq as well — is overtly hostile. President Bush made that plain in his recent State of the Union address. "The Shia and Sunni extremists are different faces of the same totalitarian threat," the president said. "Whatever slogans they chant, when they slaughter the innocent, they have the same wicked purposes. They want to kill Americans, kill democracy in the Middle East, and gain the weapons to kill on an even more horrific scale." It's not so simple, experts on the region say. "The president has a stark demarcation, where you are on one side or the other," says Ray Takeyh, author of Hidden Iran: Paradox and Power in the Islamic Republic. "Yet you see it's much more murky and ambiguous. The color of truth in the Middle East is gray; it's not white and it's not black." Undoubtedly there have been some benefits that the U.S. invasion set in motion, most importantly a political process that has fostered majority rule in Iraq. But the Bush administration did not anticipate that the invasion would aggravate the Sunni-Shia divide, says Daniel Brumberg of Georgetown University, author of Reinventing Khomeini: The Struggle for Reform in Iran. "One of the consequences of our intervention in Iraq was to exacerbate these tensions between Sunni and Shia beginning in Iraq, but then in Lebanon and beyond," he says. There seemed to be little awareness in Washington of the potential for such sectarian conflict. "Washington doesn't think in these sectarian terms," says Gregory Gause, professor of Middle East politics at the University of Vermont. "The danger is that they might not realize the intensity with which some people in the Middle East do think in these sectarian terms." That may be especially true now that the Bush administration is focusing its attention on Iran. "To the extent tensions and perhaps even violence increases between the U.S. and Iran," Norton says, "it's likely that we're going to see Shii Muslims in Iraq taking the side not of the Americans, but of their co-religionists in Iran." That's quite the opposite of the goal that Michael Hayden, the new director of the CIA, set out for U.S. policy in Iraq when he testified before a congressional panel recently. "Iraq has to be a barrier to Iranian expansionism, not a bridge for Iranian expansionism," Hayden said. But the U.S. wars in Afghanistan and Iraq removed Iran's two most dangerous neighbors and enemies. U.S. policy has worked against the containment of Iran. "Oftentimes, the paradox goes unrecognized," notes Norton, "but it's stunningly true that Iran has been the great geopolitical victor of American sacrifice and war." U.S. policy is further complicated by the close relationship between the Bush administration and Israel, and lack of progress on the Israeli-Palestinian conflict. Despite the pre-invasion claims of some in the Bush administration, the overthrow of Saddam Hussein has proved of no benefit to that issue. Says Takeyh, "I think the dream that the newly elected Iraqi government was going to reconcile with Israel is another anticipation that has vanished." The sectarian divide in the region only deepened when war broke out last summer between Israel and Hezbollah, the Shiite militia in Lebanon. 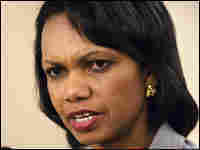 The Bush administration's reluctance to negotiate a quick end to the fighting didn't help nor did comments made at the time by Secretary of State Condoleezza Rice. "I have no interest in diplomacy for the sake of returning Lebanon and Israel to the status quo ante," Rice said two weeks into the war. "I think it would be a mistake. What we're seeing here is, in a sense, the birth pangs of a new Middle East. And whatever we do, we have to be certain we're pushing forward to the new Middle East, not going back to the old one." Although bloodied, Hezbollah emerged from the fight with its military reputation burnished. Many in the region viewed this too as an extension of Iran's influence. There have been some positive developments in the region, even if they were not anticipated by U.S. policymakers. The often violent rivalry between Iran and Iraq, which undermined security in the Persian Gulf for decades, has been defanged. "The new Iran and Iraq," says Takeyh, "are unlikely to go to war against each other. And that's good for Iran, that's good for Iraq. That's good for America." But real security for all in the region seems like a mirage on the desert horizon. "Unfortunately what we didn't see," says Brumberg, "was the costs in terms of taking decisions which would so undermine the legacy of political stability as to create the desire in some camps, and you see this in Iraq now, for some kind of revival of autocracy that would bring at least a measure of peace and security to everyday Iraqis. That is certainly one of the paradoxes of the American intervention in Iraq." At least in part because the United States paid little or no attention to the history of the region and the troubled history of the schism in the Muslim world between Shiite and Sunni. "You worked against history," says Shaheen, the Palestinian political scientist. "You did not recognize the history of the region. So if you want to build a new thing, even your new policy should be based on history. Your policy was based on nothing." That's certainly not a view that is shared by everyone. But it is held by many in the Middle East, who are after all the ones that have to live with the results of U.S. actions there. The U.S. is constantly seeking friends in this region but ends up creating new enemies, it seems. "I think the policy is full of these odd contradictions and it makes everybody angry at the U.S. in the end," says Juan Cole, professor of Middle East history at the University of Michigan. In the Middle East, there is a great awareness of and great sensitivity to the history of the sectarian divide in Islam — among the Shia and the Sunnis — just as there is a great awareness of the long and troubled history of the interaction between the Middle East and the West. It is hard to avoid the conclusion that nations that involve themselves in these conflicts, without the benefit of a deep understanding of history, do so at their own peril.